Tracker Locating provides pipeline and utility locating services to both commercial and residential clients. Our work primarily takes place on privately owned land or locations such as residential lots, farms or acreages and industrial or commercial premises. 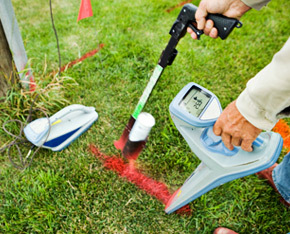 A locate describes the detection, marking and reporting of buried utility services at a work location or job-site. For example, utility lines are located by transmitting radio-frequency signals to the line. A portable receiver, scanning the line from above the ground, then assesses these signals. The detected line’s location can then be marked on the surface with paint. Finally, a report is created, showing the line’s position in relation to nearby buildings and natural features, to assist the people working on a particular project. 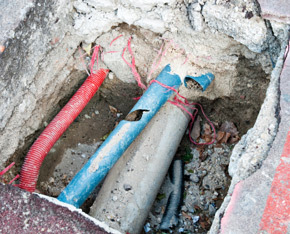 Tracker has extensive experience with underground utilities and buried facilities and also offers fault finding services, pipeline right of way sweeps, ground penetrating radar for slabs, seismic exploration locating and will locate property pins, indoor slabs, water valves, and surface valves for water or gas. Tracker’s experience sets us apart from the competition and we are fully committed to providing only the highest quality locates for all of our customers. 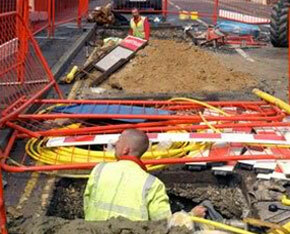 Accurate and professional on site drawings and diagrams of underground facilities are always available on request. 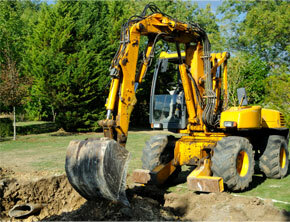 We also provide free quotations and estimates. Tracker uses the very latest electromagnetic and radio pipe and cable detectors. We also offer top quality service and speedy response time. We work closely with all local utility companies and compliment the services provided by Alberta One Call. Most work is undertaken in Calgary and Southern Alberta, but services are available in other areas of the province and in SE British Columbia.